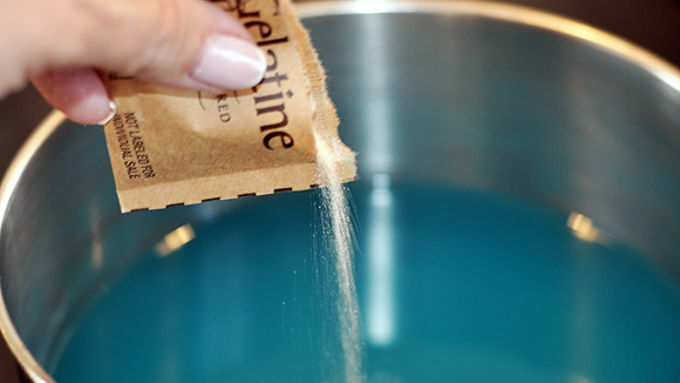 Pour 5 cups of water into a medium pan. Sprinkle Jell-O over water and heat mixture over medium heat, stirring constantly, until gelatin powder is completely dissolved in water (about 5 minutes). Remove from heat and allow to cool 5 minutes. Add vodka and stir. Pour mixture into fish bowl and place in refrigerator to chill. When Jell-O™ is almost set, use a sharp knife to cut slits into top of Jell-O™. 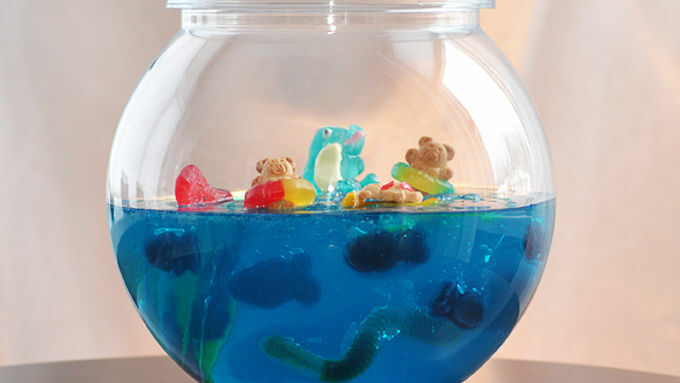 Use an uncooked spaghetti noodle or wooden skewer to slide gummy fish and other candies into position in the gelatin. Return bowl to fridge to set completely before serving. To serve, scoop two tablespoons gelatin into small shot glasses. For additional decorations, place gummy circles around Teddy Grahams™ (cut circle if necessary) and make floating rafts out of Fruit Roll-Ups™ and place a Teddy on top. Fruit Roll-Ups™ and Fruit by the Foot™ can be cut for bathing suits for the Teddy Grahams™. Place top decorations on just before serving to prevent the candies from sweating and running on top of the gelatin. Substitute flat lemon-lime soda for the vodka. Need an icebreaker for your next party? Try a fishy bowl of jelly shots! Your party will surf into high tide when you bring out this convo starter! 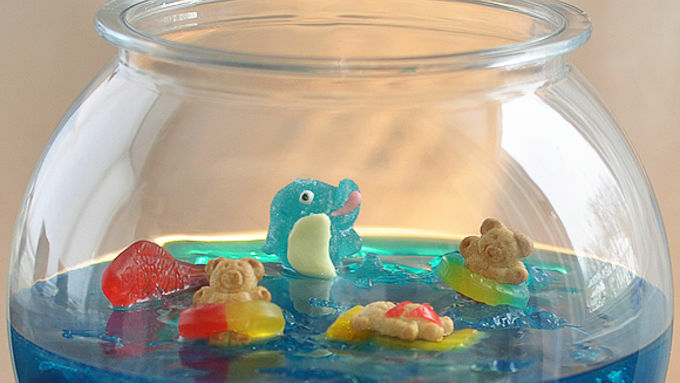 Gummy fish swim in a sea of gummy-vodka infused gelatin, while edible beach-goers frolic above. 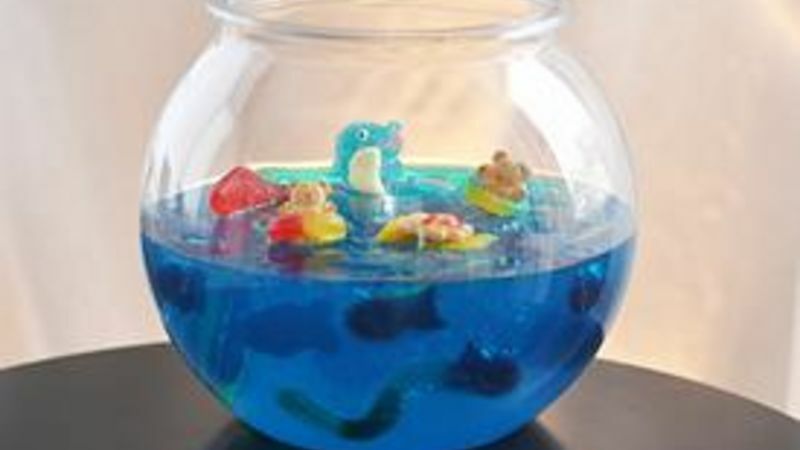 This Jelly Shot Gummy Fish Bowl takes some time, so plan for that, but the comments and smiles are totally worth it! Here's the play-by-play so you can make your own. 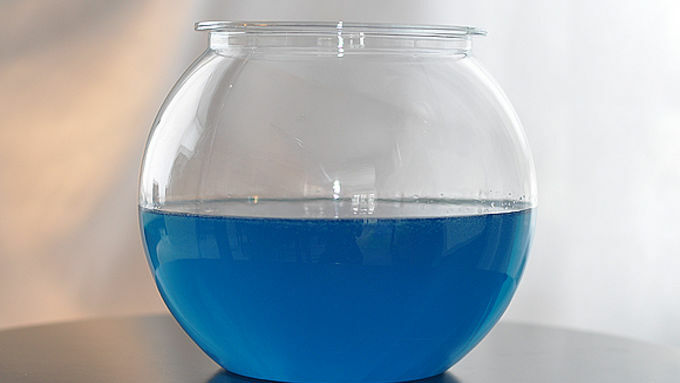 You'll need a new, 1-gallon plastic fish bowl and some gummy candies! Time and creativity are the only limits here. Place the gummies you want to see best up close to the sides, with some further back for shadowy effects. Then add your beach babes to the top. I lucked out and found a gummy dancing dolphin at a candy store too. Remove your fish bowl from the fridge shortly before you plan to serve it, then -- after everyone has oooo'd and ahhhhh'd -- scoop a couple tablespoons into shot glasses and -- down the hatch with the fishes! Display tip: The fish show up great if they're back lit, so I put my bowl in front of a window. If your party's at night, set the bowl on a cake plate in front of a small lamp. Place top decorations on just before serving to prevent the candies from sweating and running on top of the gelatin. This recipe can easily be made kid-friendly by substituting flat lemon-lime soda for the vodka. Instead of a big bowl, you can use 8 stemless plastic wine glasses and make individual portions for the kiddos. Or, for a fab kiddy party favor, use the same kid-friendly recipe version and pour a cup of gelatin mixture into 8 plastic cupcake bags (found where specialty baking supplies are sold), or sandwich bags, and place them in small bowls in the fridge to stand upright until they're set. Then slit the gelatin and add one fish, tie the bag with a ribbon -- and you have a little fishy bag that looks like it just came from the pet store! Tip: I used sharp scissors to cut Swedish Fish candy down in size to better fit the cups and bags. Have fun!